The demand in the global cardiac rehabilitation market is estimated to increment at a significant CAGR of 5.4% during the forecast period of 2016 to 2024, gaining traction from a number a factors, such as rise in geriatric population, growing burden of cardiovascular diseases, and increase in global initiatives regarding the awareness for cardiovascular diseases. On the other hand, the lack of skilled personnel and high cost of initiative investment are a few hindrances faced by the global cardiac rehabilitation market. The prosperity of this market in the near future is also attributed to high growth opportunities in the region of Asia Pacific, which houses nearly the half of the world’s population and includes two of the fastest growing economies in India and China. As per the projections of the report, the global cardiac rehabilitation market will be worth US$1,622.9 mn by the end of 2024, considerably up from its evaluated worth of US$1,010.93 mn in 2015. Changing lifestyle among the urban population, which now includes minimal physical workout and ill-timed poor quality eating, is another factors augmenting the cases of cardiovascular diseases, which in turn will favor the vendors operating in the global cardiac rehabilitation market. On the basis of device type, the global cardiac rehabilitation market is segmented into seated and upright elliptical trainer, stationary bicycle, stabilization ball, rower, treadmill, blood pressure monitor, and heart rate monitor. Among these, the elliptical trainer segment is the most profitable, accounting for nearly 27% of the overall demand, which is a reflection of its diverse benefits as it can mimic climbing stairs and helps the patients in cardio fitness. As per a study by the National Center for Biotechnology Information, elliptical trainers are significantly more helpful than walking on treadmill or ground as well as cycling, and the demand for seated and upright models are expected to remain in-demand throughout the forecast period, during which the report expects the segment to increment at a CAGR of 6.0%. On the other hand, heart rate monitors segment is also gaining demand, owing to technological advancements, reliability of the outputs, and portability. Owing to high percentage of disposable income, robust healthcare infrastructure, and adoptability of new technology, North America with developed countries such as the U.S. and Canada is currently the most profitable region as far as the market for cardiac rehabilitation market is concerned. In 2014, North America served 50% of the demand in the global cardiac rehabilitation market. However, emerging economies such as India and China, which resides a vast population base, are expected to turn Asia Pacific as a highly lucrative region in the near future, followed by Europe, and Latin America. Asia Pacific, in particular, has been projected to increment the demand at a CAGR of 6.8% during the forecast period of 2016 to 2024. The global cardiac rehabilitation market is highly consolidated with Brunswick Corporation and Technogym accounting for more than the half of the shares in 2015. Some of the other key vendors in this market identified by the report are Johnson health Tech Co., Brunswick Corporation, and Amer Sports. In the near future, new product development and geographical expansion are expected to be two most important strategies by these leading vendors to increment their consumer base. Increasing burden of cardiovascular diseases has made the global population realize the importance of physical activities in daily routine. This has increased demand for cardiac rehabilitation programs. Such programs help the patients to recover early from any previous cardiac strokes. A cardiac rehabilitation program is a comprehensive activity, which is continuously monitored in order to assist the population to improve their lifestyle. Various cardiovascular risk parameters are monitored and are tapered to healthy level. Cardiac rehabilitation programs include exercise training, monitoring of body vitals, education about healthy habits, and various other activities that helps the body to retain its healthy state. Cardiac rehabilitation activities help reduce the risk of future occurrence of cardiac strokes, reduce the pain and requirement for medicines in cardiac treatment, improve health status by decreasing the risk factors for cardiac attacks, and help to improve the health status by reducing the risk factors. The rising burden of cardiovascular diseases across the globe drives the cardiac rehabilitation market. Factors boosting the cardiac rehabilitation market are rising geriatric population and increasing awareness about cardiovascular diseases. Interventions from government and international bodies such as the World Health Organization and the America Heart Association help to increase the level of awareness across the globe. Thus, increase in awareness level is expected to boost demand for rehabilitative products. Physical activity is a significant part of a cardiac rehabilitation program. Hence, exercise equipment and devices play a significant role in cardiac rehabilitation programs. Cardiac rehabilitation equipment are classified into exercise equipment and monitoring devices. These help improve cardiac health, increase metabolism, improve hormonal profile, and recovery ability. Demand for indoor exercise equipment has increased due to changing lifestyle and habits. Cardiac exercises assure reduction of essential parameters such as blood pressure and heart rate to normal levels. Cardiac performance is measured through indicators on various monitoring devices such as activity trackers and wristbands. Monitoring devices track and continuously monitor the vital stats such as blood pressure and heart rate. Moreover, these equipment offer low impact workout to the user. Due to continuous changing demand of customers with respect to features offered by cardiac rehabilitation products, the market experiences high innovational activities. Blending of advanced technologies and improving product offerings has been a common trend in the market. The continuous integration of advanced technology with existing basic equipment leads to volatility in market dynamic in terms of features. This dynamic market increases the rate of obsolescence and shortens the lifespan of a product. The apparent implication of such behavior of market increases the cost for both manufacturer and end-user. 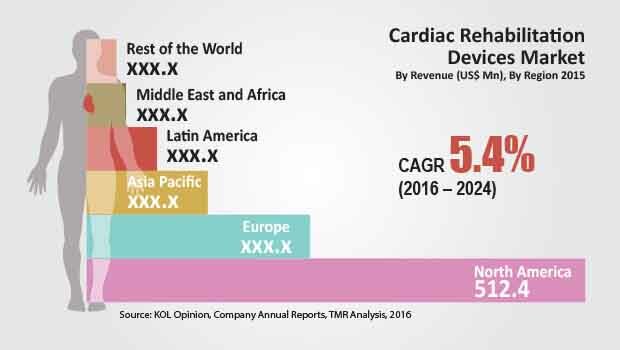 The global cardiac rehabilitation market has been segmented based on device and geography. Based on device type, the market has been categorized into exercise equipment and monitoring devices. The treadmill segment accounted for the largest share of the cardiac rehabilitation market. The heart rate monitor segment is expected to witness the highest compound annual growth rate during the forecast period. Cardiac rehabilitation devices also include elliptical trainer, rower, and stationary bicycle. Geographically, the market has been divided into six regions: North America, Europe, Asia Pacific, Latin America, Middle East & Africa, and Rest of the World. North America accounted for the largest share of the global cardiac rehabilitation market in 2015. The market in Asia Pacific is anticipated to grow at the fastest pace from 2016 to 2024. Major players in the market are Ball Dynamics International, LLC (Longmont, U.S.), Core Health & Fitness, LLC (Vancouver, U.S.), Honeywell International, Inc. (Brookfield, U.S.), LifeWatch AG (Zug, Switzerland), OMRON Corporation (Kyoto, Japan), Patterson Companies, Inc. (Warrenville, Illinois U.S.), Philips (Amsterdam, Netherlands), Amer Sports (Helsinki, Finland), Smiths Group (London, U.K.), Halma plc (Buckinghamshire, U.K.), and Brunswick Corporation (Illinois, U.S.).